Welcome to AMIDI, an association of Mayan women who farm and weave. 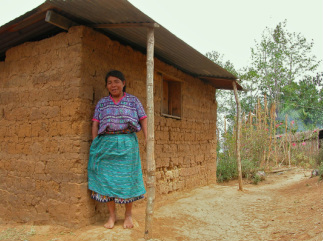 The 56 members live traditionally in an isolated area of the Guatemalan Highlands. Please explore with us AMIDI’s world of courage, poverty, inspiration and artistry. We invite you to join our people-to-people campaign, now in its thirteenth year, to assist this exceptional group. AMIDI members are dedicated to freeing their community from a perpetual cycle of poverty. They seek educational opportunities for their children and themselves. As guardians of the Mayan culture, they are determined to maintain the native Kakchikel language and preserve their ancestral art: backstrap weaving. They also strive to increase incomes by growing organic medicinal plants and coffee, alongside traditional corn and beans. AMIDI stands for the Asociación de Mujeres Indigenas Para Desarrollo Integral: Association of Indigenous Women for Holistic Development.